Any 1.d4 players in the house? If so, you may be interested to know that I am currently editing the final volume from the Doctor of d4 himself, and our original Grandmaster Repertoire author, Boris Avrukh! As most of you know, the original volumes 1&2 (published in 2008 & 2010 respectively – how time flies…) have been revamped into the newer and upgraded volumes: 1A The Catalan, 1B The Queen’s Gambit, 2A King’s Indian & Grünfeld and finally volume 2B will complete the series. This final volume is subtitled “Dynamic Systems” (though I want to rename it “Dynamic Defences” – any opinions?) and will cover the Dutch, various Benoni systems not already covered in the series, the Benko & Budapest Gambits, and anything else which did not feature in the previous volumes. So far, I am impressed by the vast number of improvements Avrukh has made over his previous work. This is not the time to give away any big novelties, but I can tell you there’s a useful change of direction in an important Dutch line, which I was able to use to good effect in a recent tournament game. I was also surprised when I started working on the Benko Gambit chapters and saw that the Fianchetto (which I have never been a great fan of against the Benko) has been replaced by the traditional main line of 6.Nc3 followed by e2-e4, Kxf1 and so on. After a panic-stricken few minutes of scouring the previous volumes for unwanted Fianchetto Benko transpositions (of which there are none, thankfully! ), I am convinced that this is another excellent change. Aha, now we know Andrew that the so called editing work is all a ruse to pilfer the top novelties for your own personal use. Any timeframe when we’ll see it? No fianchetto against the Benko is good news. I wonder if it will be the mainline with 12 a4? On the title, I think ‘Dynamic Defences’ sound better than systems too. I am super curious to see what he offers against the Dutch! His old 6.b3 was kind of soft. Slightly unrelated but any news on forthcoming Negi e4 books? Always difficult to find the correct title. I dont think all in this volume are “dynamic defences”, and there is also dynamic defences in the previous volumes so i think itis not well adapted. One question regarding Avrukh’s books: Will you also do (in some future) an updated version of his Grünfeld books? I really like them and would very much appreciate that. That’s excellent news. Any rough idea of when you think this will get published? Love to see it though I am still on Chapter 3 of 2A! There is no such plan and doubt there will be. Although, I usually like having the same structures as in the previous books just so I can further refine my experience in those lines while benefiting from subtle improvements. For example, I still use e3 in the QGA lines because I don’t like the position after 1. d4 d5 2. c4 e6 3. Nf3 dxc4 4.e4 b5. Also, players tend to be less familiar with something like the fianchetto Benko and there’s benefit from practicing similar structures. Of course, I’m sure there must be a good reason for the change in lines and it’ll probably be better once I get used to it. I’ve been happy with all my purchases from QC so far. The ambitious plan is for Andrew to not leave the office and for us to send it to the printer just before Christmas. Great, looking forward to this one! Even if I don’t play 1.d4 anymore, it still is interesting to see what Avrukh recommends against the Leningrad Dutch 🙂 . Yes, with luck. Without in February. Get. Into. The Dungeon. NOW! … and someone please throw the keys away afterwards! Just make sure that Andrew can get access to food and sanitaries somehow. Serious question: Will there be some guidelines about the triangle system? I.e., 1. d4 d5 2. c4 e6 3. Nf3 c6 – I find 4. g3 dxc4 not satisfactory here, and transitioning to a Semi-Slav is not what I want either. Wasn’t this already covered in volume 1B on the Slav? I thought Avrukh’s recommendation was 1.d4 d5 2.c4 e6 3.Nf3 c6 4.e3, followed by an early b2-b3. And of course he also treats the Stonewall. That is correct. Chapters 10 and 11 of GM 1B deal with exactly these set-ups. Btw, I’ve missed it too, when searching for it in 1A. I know there is basically 1.d4 Nf6 2.c4 e6 there, but looking for it in the Catalan section when so many transpositions back to Catalan are possible is quite natural imho – especiallay as you could reach it via 1.d4 d5 2.c4 e6 and not slav move order exclusively. Ntirlis’ and Lokanders books on 1.e4 e5 are so great because they have a lot of guidance and also a lot of explanations why certain lines have _not_ been choosen. 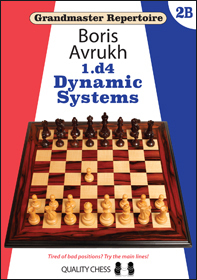 Avrukhs books have the latter mainly only referring to his old books GM1 and GM2. It would have been perfectly fine imho to write something at the very beginning of GM 1A about a triangle move order and why Avrukh does not prefer g3 there with a hint to look for it at a slav move order in 1B. Game could start 1.d4 d5 2.c4 e6 of course – and that particular move order is just not covered by Avrukh as far as I can see. In fact, I think it happens a lot with triangle players just to avoid the exchange slave. You have to work out on your own that you do not play 3.g3 here (a move played by Giri and others) here (as recommended after 1.d4 Nf6 2.c4 e6), but 3.Nf3 to stay consistend with the overall repertoire. Otherwise play might continue 1.d4 d5 2.c4 e6 3.g3 c6 4.Nf3 d;c and by delaying Nf6 you are out of Avrukh’s books (but still very much in the spirit of the Catalan). Now handling the 4 volumes is already quite tricky. For Tarrasch for instance you have to look at GM 1A _and_ GM 1B, for Benoni at GM 1A and 2B and so on. I would love to have some overview how to handle all four books in 2B (where to find what, transpositions etc.) – now that 2B is ready for completion. with Q pawn opening there are a lot of possible transpositions . As you says, move order is a major issue if we want to keep consistency within our repertoire. It would be of great utility to have chapters making clear the move order problem in each book…. Even if i know that there is no universal solution ( except KI set-up) and that there is Always one move order that we want to avoid. I totaly fell in love with Quality Chess books 🙂 particularly the GM series. I’m really looking forward reading your answers! 😀 Thank you for all the effort that the QC-team puts into these books! Firstly, I am sure that most people who bought GM 1A already had the original GM 1, in which case they should know he favours 3.Nf3. And secondly, even if a reader had never read GM 1 and was building a 1.d4 repertoire from scratch, they would still have had to find their own ideas against the Triangle, Slav and all other defences in the meantime. To both Reyk and RVY, regarding the idea of some kind of ‘super index’ in the final volume – I take your point that this could be useful, but the book is already shaping up to be larger than expected so we probably won’t have space for anything extra. I try to be as helpful as possible when pointing out transpositions during editing; for instance, instead of merely saying “this is covered in Volume X”, I usually include a chapter and sometimes an exact page number, so I hope this makes things at least a bit easier. We do not plan to re-work GM Repertoires 3,4,5 or 10. On the English Opening, I would rather have a new original book rather than re-working an old one. And the same is true in general. On the Open Games and QGD, Nikos did a fine job in his ‘Playing 1.e4 e5’ and ‘Playing 1.d4 d5’ books. Not GM Repertoires I know, but still fine repertoires. Sorry it’s all “no” so far. We may well have new books one day on some of the openings you mention, but nothing I can announce now. Though we do already have a GM Repertoire reply to 1.c4 included in ‘GM Repertoire 19: Beating Minor Openings’ by Victor Mikhalevski, who is a superb analyst. Victor’s repertoires tend to hold up excellently for years (with the Open Spanish as another example). Nikos made some updates for GM10 when it went to Forward Chess. I think some of them will be in our free PGN, but I am not certain. “Super Index” sounds pretty useful. One of the first things I do with an openings book is mouse the index of variations into a pgn. It is not much effort. I don’t have the Avrukh books, but maybe someone who has all of them would be willing to do this super step. And maybe Quality Chess would be willing to host an edited version of this file. Not to give away any significant content, but just to point the way through the thicket of transpositions. Cutting off arbitrarily at move 5 or move 7 (or judge on a per chapter basis) could be a reasonable compromise. Actually something like this would make a great freebie on Forward Chess. 0.05% of the book for free might just sell the other 99.95%. It’s certainly worth an experiment, and see how the cost/benefit plays out. I agree, the super-index would be a great service and I strongly doubt that it would reduce # of units sold. Thanks for all the clarifications on the Triangle, by the way. For those who are interested the forward chess webpage has 1A on the Catalan on sale today (today only) as part of their Dec promotion for $9.99 (plus vat if you are in Europe). Is the Modern Bogo (1.d4 e6 2.c4 Bb4+) mentioned in this book? I can’t find it in the first series and in 1A. It will be included in the final volume 2B. Indeed, it was one of the bigger omissions which we overlooked in the original GM 2, so we made sure to remind Boris about it at an early stage. No trasposition in the benko? What about 1.d4 Nf6 2.c4 g6 3.g3 Bg7 4.Bg2 0-0 5.Nc3 c5? If white plays 6.d5 d6 it is highly likely to transpose into a benko for example Nf3 b5. Also against 1.d4 Nf6 2.c4 g6 3.g3 Bg7 4.Bg2 0-0 5.Nc3 d6 6.Nf3 c5 white can’t play 7.d5 if he wants to avoid the tansposition. Does it mean this book will cover 7.0-0 ignoring c5 and transposing in some sort of of simmetric English? Or can White always avoid transposition by playing a4 against a6? Indeed, after Nxb5 I am not convinced by Black’s ‘Benko-style’ compensation along the b-file. Black can try …c5 on move 3 or 4, since d4-d5 can be met by …b5, with a better version of what Davide suggested. But Boris already considered this plan, and recommended dxc5 against it in GM 2A – so once again, there’s no Benko transposition. Less than two weeks till it goes to print and then another 3-4 weeks. Maybe Avrukh should write a new GM-Rep: Opening for White according to Kramnik! Phil Collins :Maybe Avrukh should write a new GM-Rep: Opening for White according to Kramnik! I think GM Khalifman has already done that on two occasions……a little dated now but still good reading. Then maybe Avrukh could take Anand instead. Forget Kramnik (with all due respect, of course). How about “A Black Opening Repertoire According to Timur Gareyev”? That might entail a health risk to the author, however, so maybe it’s not such a great idea. Ok, then take another grandmaster. Karpov maybe. What openings does he play? Ok, I give up and opt for something completely different: A repertoire based on Ulf Andersson’s games. You’d be safer picking a non-elite GM. Someone like Aleksander Wojtkiewicz for example. For black or for white? I am a Leningrad player. Any delay is highly appreciated. The ideal scenario imo is to quickly publish Avrukh 2B, followed shortly after by Marin’s book on the Leningrad, in which he repairs Avrukh’s novelties. Possibly a pdf extract available tomorrow night before close of play? We have a guide book coming on the Grunfeld. Your instinct is right. But it is still some time off. What is the reason of such a delay if I may ask? I’ve been out of the loop for nearly a year. I understand the Najdorf is a “long-term project” (as in whenever). But with Negi going for a Ph.D. at MIT are the final two volumes of 1 e4 now history? If not, what are the plans? Sorry for asking you to retread the same old questions, but I have an interest in obtaining these final three volumes before I die. My repertoire would be complete. Thanks. The fifth volume will be out in the spring, I think. Who is the writer of the gi guide book? A young dynamic guy who likes openings. More later. Thomas you forgot to ask which Spring. At the risk of sounding like a broken record, what progress on the Taimanov Sicilian? We are making steady progress but we are not ready to announce a date. The excerpt only comes when we have a finished file which is ready to printing, so clearly we are not yet at that stage. Taimanov, we are talking April probably. 2B will be in March with the Kotov book, which has been sent off to print. No excerpts until Colin returns. Shaw always had a grey beard to begin with. Time to hire Gandalf the White? Then he started writing his book on the King’s Gambit…..
1.Is it possible to add an update with the 9. … Re8 10.Bf4 Bf5 in the Benoni? 10. … Bf5 existed prior to 2016, so it is sad it was not even mentioned. 2.Move order issue. One of the big changes was that Avrukh tackles Benko with the mainlines (where he did a great work tbh). Due to this, since he plays Benko without g3, he added dxc5 instead of d5 in KID moveorders [e.g. 1.d4 Nf6 2.c4 g6 3.g3 Bg7 4.Bg2 c5 5.dxc5!?]. But in his new book 2B (see Chapter 8) he shows 1.d4 g6 2.c4 Bg7 3.Nf3 continuing with the Coverage of 3. … f5. But should black Play 3.Nf3 Nf6 4.g3 (as we Play regular KID) c6, which results in the wrong Grünfeld line. Shouldn’t it be 1.d4 g6 2.c4 Bg7 3.g3 instead?